Since the passing of the famous English golf coach, Mr John Jacobs. I have reread a couple of his books that I have on my bookshelf. 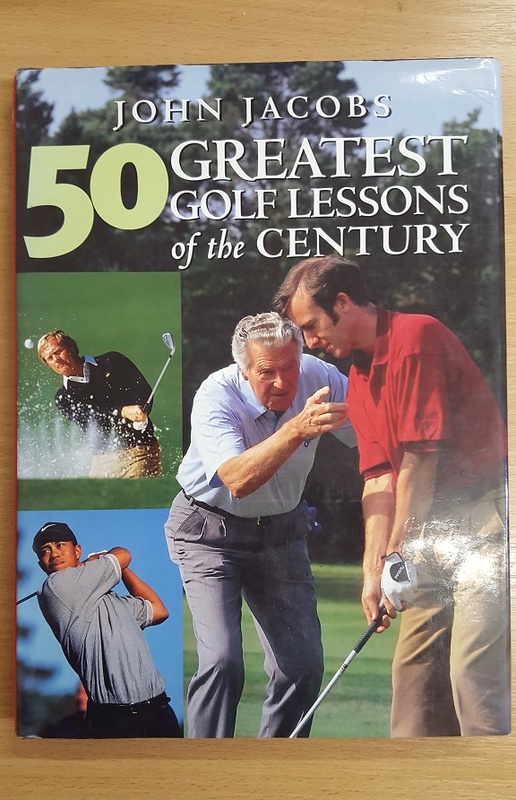 Notably, I started reading “50 Greatest Golf Lessons of the Century”. In this book, from the dawn of golf to the modern day golfers, Mr Jacobs talks about 50 of the greatest golfers in the world during that period. From such great golfers as; James Braid, Henry Cotton, to Ben Hogan, Nick Faldo, Tiger Woods and Seve! Consequently, with my golf coaches hat on, I have picked three golfers out of the fifty that struck a chord with me. The 1st was about Seve Ballesteros and “Imagination is the Key to creativity.” John makes a comparison between how Seve learnt to play the game with his 3 iron on the beach and how John learnt to play chips shots with a hickory club on their invented par 3 course behind the back of the caddie shed at Lindrick Golf Club. Both played for hours and used their imaginations to play different shots. Certainly, Mr Jacobs points out that golfers should practice all types of lies, good, bad and indifferent. Similarly, challenge yourself and practice playing crazy and fun shots. Learn to visualise those shots in your mind and in time you will develop the golfer’s “touch and feel”. Or as he says “feel it, see it, play it, then the shot becomes reality”. Gary Player The Master of Bunker! Gary Player is known for how much he practised golf, he has won multiple golf events all over the world and his physical fitness. The amount of time he has spent hours practising golf shot out of bunkers is well documented. Jacobs points out that golfers should practice from good bunker lies to terrible lies. Practice, hitting the ball taking a lot of sand and very little sand. Golfers should learn to adjust setup and swing path. So golfers can deal with plugged sand lies to the ball stuck on a slope with their feet outside the bunker. Golfers should use their mind to dream up all the worst places you can be in a bunker and practice! Sam Sneed Clearing the hips! Uniquely, Sam was possibly one of best rhythm golf swingers of all time. Finally, John Jacobs mentions a key movement within Sam’s swing. “You have to learn to clear your left side in the downswing”. Notably, what John is talking about here is the hip movement during the downswing. By the same token, when golfers have not played golf in a while, the golfer’s body movements can be out of sorts. In summary, the golfer’s swing sequence is a bit muddled up. Therefore, I would certainly recommend working on hip turning exercises and the pause/hold and swing drill. On a final note, I would recommend reading this book to find which of his golf swing tips takes your fancy. May I add, please only take note of the tips that make sense to you and your golf swing. Please take note, that his ball flight philosophies are out-dated. There has been a lot of scientific evidence since that book was printed that proves other factors are responsible for initial ball direction. However, this book is still a great read and if you have any questions about those tips. Please do not hesitate to contact me.